MMHR went to the 74th Annual Dallas Independent School District/Coca Cola Basketball Tournament and the 56th Annual Whataburger Basketball Tournament in Ft. Worth, Texas December 27 and 28. In the process of preparing for scouting an event, one does research on players to see play in order to confirm through observations what has been written about in articles, rankings, and various reports of other evaluators. It is always a pleasant surprise to come across a golden nugget of a player. MMHR did such a thing in Rashard Odomes(2015) of Copperas Cove HS, alma mater of RGIII. Later on Friday afternoon, MMHR got a chance to see Dallas Woodrow Wilson play against Copperas Cove HS, which is 2 and 1/2 hours south of Dallas, TX. The 1st quarter was quite entertaining. Kerwin Smith(2014), 6’9″ P and Grand Canyon University signee, set the tone for Wilson HS with an alleyoop. Hassan Thomas(2015), 6’7″ P/W, was very aggressive on the block and scored at will. 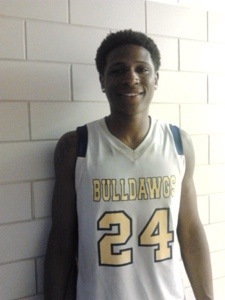 But Rashard Odomes(2015), 6’6″ G of Copperas Cove HS, had an answer and some for every Wilson HS basket. Whether it was setting his teammates up with a penetrate and kick out or lay up, Odomes used his height and vision to give his team a 23-16 1st quarter lead. Thomas(2015) of Wilson HS continued his aggressiveness in the 2nd quarter. He was very active and got his hands on a lot of balls. Smith(2014) of Wilson HS, who reminds me of a young Samuel Dalembert, had a highlight tip jam. Carlos Simpson(2016), 5’9″ PG Wilson HS, joined the party with coast to coast plays ala Chris Paul. Another player that stepped up for Wilson HS in the 2nd quarter was Mykeus Woods(2017). He is a 6’2″ W with a nice stroke. Once again, Mr. Odomes came to the rescue. This smooth, athletic, lefty hit NBA range 3s, hit mid range jumpers, and used his NBA ready body to shield defenders to finish at will. Copperas Cove took a 42-31 lead to half. In the 3rd quarter, Simpson(2016) tried to rally Wilson HS with fullcourt pressure defense and penetrating into the key setting up his teammates with kickouts and layups. Odomes and Copperas Cove did not buckle and increased their lead by 1 point at the end of the 3rd quarter, 57-45. Wilson HS made various stabs at getting back into the game in the 4th quarter, but Rashard Odomes’ 27 points proved too much to overcome. Copperas Cove won 68-62. Wilson’s leading scores were Kerwin Smith(2014) 22 points, Hassan Thomas(2015) 14 points, and Craig Martin(2015) 11 points. Besides Odomes, Copperas Cove got 16 points from Montre Williams(2014).